Many of us raised in a Christian church know lots of Bible stories. We know about the sins of Adam and Eve, Abraham's willingness to sacrifice Isaac, the leadership of Moses and Joshua, Samuel's anointing of Saul and David, David's killing of Goliath, the wisdom of King Solomon, the birth and ministry of Jesus, the resurrection story, Paul's Damascus Road story, problems in the early church, etc. But we may be unable to see the forest for the trees and not have a clear view from the 50,000 foot level of how all those stories comprise THE BIBLE STORY, the theology of the Christian faith, the narrative that begins with the creation stories of Genesis, continues with the choice of a people and promise and arrival of The Messiah, Jesus Christ, and ends with experiences of the early Church, the continuing "Body of Christ." All that story can rightly be called The Gospel, the good news, focused on Jesus Christ, God in flesh, Savior of the world. The reason for always keeping THE BIBLE STORY in mind when we read Sacred Scripture is that it keeps us from going off on tangents, from grabbing verses or stories out of that overall context and drawing misleading lessons from them. No matter how deeply we dig, we must always remember the big picture, the context, and make sure our conclusions and positions make sense in that overall context of theological truth. 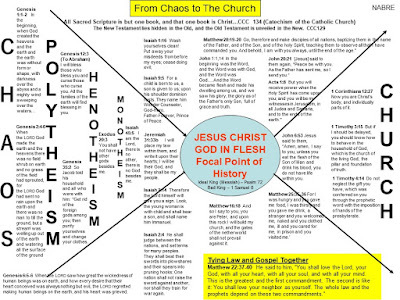 The chart below is an attempt at visual presentation of THE BIBLE STORY, from the pre-creation chaos, through the revelation of God, to the one holy, catholic, and apostolic church, the continuing Body of Christ, into which we are invited today. Here is not just one verse out of context but thirty one, carefully chosen to illustrate the major parts of that important story. Since the chart is not readable in this post, it is broken into three sections below for improved legibility. There are a title block, a left side, BC so to speak, and a right side, AD so to speak. To download and print the entire document in readable size and resolution, use this link. I'll begin with two fundamental teachings of the Catholic Church about the Bible, and about the relationship between the Old and New Testaments. 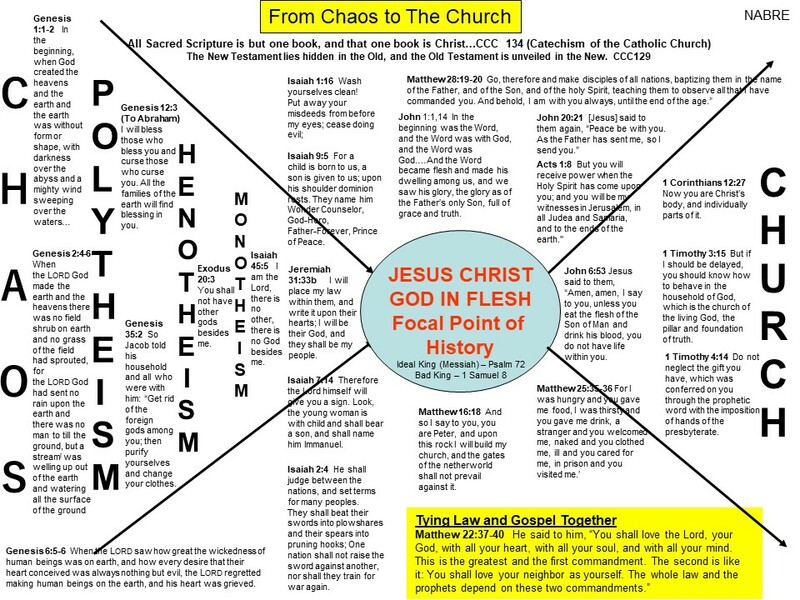 The left side of the chart covers creation to the prophetic promises of the Messiah, the Anointed One, the King, Jesus Christ. The theological truths taught in the ancient creation stories are that God created all, His creation was good, and that humankind messed it up. Then God chose a people out of the resulting chaos and revealed himself to them as not one of many gods (polytheism), not even the most important god of many (henotheism), but the one and only God (monotheism). And then prophets Isaiah and Jeremiah began to announce the promise of a Messiah and a new way of living, of being washed clean, of the end of war. These sixteen verses are chosen to illustrate that revelation of God resulting in realization by the people. The right side of the chart covers the incarnation, God in flesh, the ideal King, fully God and fully human, coming and dwelling among us. He heals and teaches and gathers followers, disciples, some of whom become apostles. He teaches prayer, the greatest commandments, the Great Commission, and promises the Holy Spirit. He establishes and teaches the Sacraments. Then he returns to the Father and leaves his Apostles in charge. Under the promised guidance of the Holy Spirit, they build, lead, and guide the early Church, dealing with issues as they arise, under the promised Holy Spirit. And that is THE BIBLE STORY, admittedly over-simplified, illustrated by just thirty one verses. Anytime we take deeper dives into Sacred Scripture, it is helpful to remember where we are in this miraculous story and make sure we consider that context in our search for understanding.